If you have a bad Harley dash ignition switch, or a broken fork lock, you will want to replace both components in order to keep one matching key on your Softail. Replacing the fork lock is an involved, lengthy process which requires you to disconnect a number of components in order to drop your front end/fork stem from the neck of the frame. Replacing the Harley dash ignition switch, on the other hand, is simple. Be sure to disconnect your battery ground before beginning work. Work safe. There is constant voltage running to the ignition switch, at all times. Use a 1/2 wrench to remove the acorn nut that secures to dash assembly to the fuel tank. Then, carefully pull up and tip the the dash to one side. If you have a 2nd set of hands; now is a good time to utilize them. Have your helper hold the dash while you disconnect the electrical plugs and unscrew the odometer reset/trip button. With the dash free from the motorcycle, set it upside down on your workbench on a clean, soft towel. Now you can simply remove the four small screws that retain the switch, swap out the Harley dash ignition switch, and reinstall the four screws. Be careful not to over tighten the hardware. Tighten, only, until snug. Reinstall the dash/speedo assembly in reverse. Make sure the harness and plugs are returned to their original positions beneath the dash and that the dash trim is correctly positioned between the dash and the fuel tank. Riders with older Evos can upgrade to this style switch. You will need to space the switch up on the dash plate so that it is correctly orientated in the dash. Then, neatly, wire the new style plug, adapting it to the older harness. Everything will be powered up with just one click to the left, but breakers will still be separating ignition and lighting circuits. 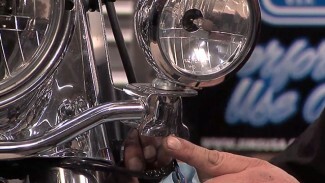 Please review Harley-Davidson ignition switch knob removal and the Harley ignition switch tip. When installing exhaust gaskets you want to make sure they do not bunch up. This can cause an exhaust leak or a restriction in exhaust flow.